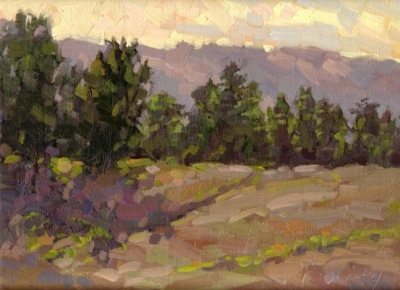 Here’s the second of the two studies I painted Saturday at Crystal Springs. I’m happy with the subtle colors of the background hills–in particular the variation between trees in shado (violet) and those in sun (orange-violet). I played around with the shadows cast by the trees on the foreground hill quite a bit. Do you think it reads well as a cast shadow?